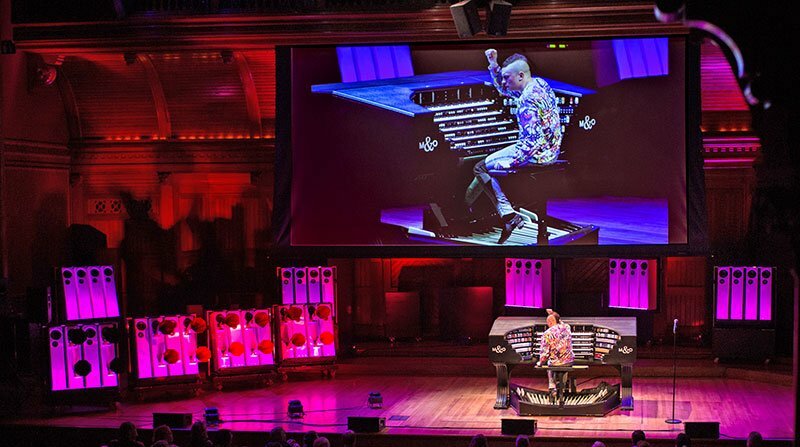 Cameron Carpenter’s Boston-area debut at the helm of his new International Touring Organ came Thursday to Sanders Theater in a Celebrity Series of Boston/Boston Chapter of the American Guild of Organists presentation of exciting music for organ—old and new. Designed by Carpenter and launched in 2014, this cross-genre digital instrument was built by Marshall & Ogletree of Needham. Their opus 8 is based on a plethora of sounds sampled from a wide range of organs (ranging from traditional church pipe organs to Wurlitzers). The organ tours with an extensive 40-speaker array, insuring consistency across venues; identical sound systems are housed in Needham and in Berlin, making this a truly international instrument. As Carpenter says, “One of the things that is so important about this touring organ, and one of its great trump cards—one of the things that the pipe organ can never provide—is a sense of psychological home. I can call up sounds from the organ that in some sense first made me want to do what I’m doing.” Carpenter champions this machine as the future of the organ. Having a “portable device with a wealth of registers allows organ music to leave the church, the loft, even the cinema. The positioning and equalizing of the speakers allows an effective match to the performance venue, in an approximation of the way a pipe organ is voiced to its permanent space. At the same time, its cross-genre nature finds it is equally at home playing classical, film, crossover—all genres of music. One insurmountable fact about the ITO is that it is electronic. Though it produces an unrivaled variety of registration and tonal colors, it has a sound quality different from a traditional pipe organ. It took me a few minutes to adjust my ears and my expectations to the available sounds. In this respect, the entire audience faced a new instrument like an itinerant organist would. I was also struck by the unusual soundscapes in some of Carpenter’s arrangements of symphonic music; knowing some pieces quite well, I found the color assignments in these transcriptions fascinating. Lastly I noted an almost immediate response when playing this organ; it allowed for faster tempi with uncompromised precision and clarity. The program was announced from the stage: J. S. Bach’s Prelude and Fugue in A Minor, followed by Carpenter’s own transcription and arrangement of Shostakovich’s Festive Overture, Op. 96, then Bach’s Trio Sonata No. 1 in E-flat Major, Albéniz, “Evocación” from Iberia, Dupré’s Variations on a Noël, Op. 20, Bach’s Toccata in F Major (performed in F-sharp Major), Carpenter’s own Music for an Imaginary Film, a Gershwin song medley, and Scriabin’s Piano Sonata No. 4. That there was no printed work list meant that Carpenter spoke between pieces, talking about the history of the organ, his own history with the instrument, and his commitment to this ITO. He is an intelligent, eloquent, and amusing speaker, so this was an added treat. Carpenter has a truly incendiary technique. He made extensive use of “thumbing down” (one hand playing two manuals simultaneously), even when playing Bach. There was a deft agility throughout the concert, as Carpenter demonstrated his mastery and love of this organ and of the music. After a relatively straightforward Bach a minor prelude, I first noticed a huge wealth of colors and tonal variations in the Shostakovich; true, an organ cannot convey the same palette as an orchestra, but the registrations he chose were appropriately varied and visionary. The Bach Trio Sonata is a work he described as “a return to first principles” requiring a Zen-like concentration which is “hard if you have a large ego like me” (to give a sample of his mock self-deprecatory humor and commentary). In this piece there were still flourishes and embellishments, alongside technical accuracy and a joyous display of music-making. The Albéniz was a model of evocative registration, here played with passion. Dupré’s variations on the delightful and ancient carol, Noël nouvelet, are full of irony, humor, and a sense of the macabre (which Carpenter emphasized). Carpenter’s own composition is a paean to the mighty Wurlitzer and the tradition and musical conventions of the theater organ world in its exceptionally vivid fantasia. The Gershwin song medley was tuneful and playful, but somehow also reserved, as though emotions were divorced from the notes. By contrast, the Scriabin was a treat; after describing “a shocking disinhibition notated into his music,” Carpenter then embodied this exuberance. Carpenter encored with Bernstein’s Overture to Candide in a happy transcription that encapsulated the joy and naïveté, the heartbreak and sorrow of this show. 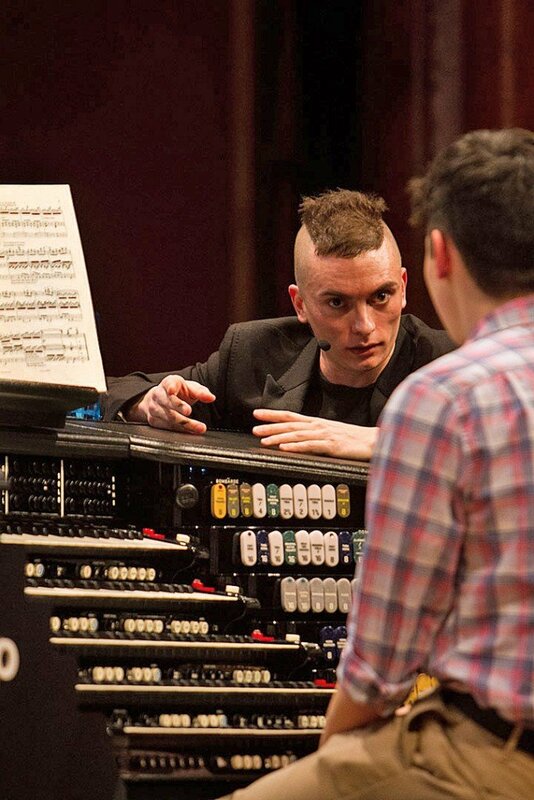 Cameron Carpenter represents a new model of an organist. The possessor of virtuosic technique and stamina, he revels in the display of technical mastery, yet he is also a consummate showman. He spoke of the dual natures of the organ: linked to sanctity and majesty in church settings, it is also present in movie palaces where it expresses cinematic desire. The sanctified humility of Carpenter’s stage bows (which closely resemble Thai wai) coexists with his eroticized stage persona. The majestic, dignified power of the organ for him supports a voluptuous sensuality of musicmaking. Some might have found this ripeness an affront to propriety or might bemoan a lack of elegance; perhaps that accounts for a somewhat diminished audience after intermission. I found the show and showman to be charismatic and moving, entertaining, and memorable.